All are welcome to attend the second of the Summer Term’s screening and discussion sessions which will take place on the 15th of May in Jarman 7, from 5pm to 7pm. 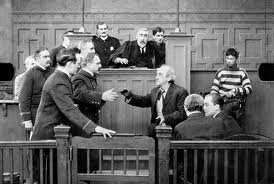 We plan to screen some short melodramas, which will probably centre on the early works of American Cinema pioneer DW Griffith. As well as influencing editing techniques, Griffith was well known for his melodramas such as Broken Blossoms (1919), Way Down East (1920) and Orphans of the Storm (1921). The films we may show include What Shall we Do with Our Old? 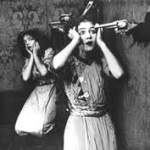 (1911), An Unseen Enemy (1912, starring Lillian and Dorothy Gish) and The Mothering Heart (1913, starring Lillian Gish). 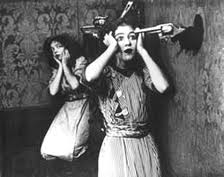 Suspense (1913) is an early narrative film about a woman and child threatened by an intruder in their home. One of the film’s directors, Lois Weber, was a prominent female director in early cinema and she also wrote, produced and starred in many of her films. 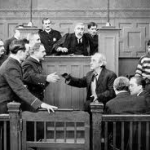 Weber’s films often featured social problems and tackled controversial issues, as with Hypocrites (1915), Where Are My Children? (1916) and Shoes (1916). This latter film – which tells the story of a woman who sells her body for much-needed work shoes – bears a striking resemblance to the themes discussed with last week’s Love on the Dole. Both Suspense and Bluebeard continue in one of trends we have explored in other melodramas: namely the focus on the woman’s story which often features the female protagonist suffering in some manner. In this sense Suspense and Bluebeard can also be classified within the gothic tradition – a genre/cycle closely related to melodrama – as the films place a particular emphasis upon the domestic home as the site of terror and danger. Gunning, T. 1991. “Heard over the phone: The Lonely Villa and the de Lorde tradition of the terrors of technology.” Screen, 32 (2): 184-196. Méliès, G. 1907. “Kinematographic Views”. In: Gaudreault, A. 2011. Film and Attraction: From Kinematography to Cinema. Urbana, Chicago and Springfield: University of Illinois Press. In addition to screening shorts, we will be discussing plans for the group’s future such as the possibility of organising a conference or symposium as well as publishing opportunities. Do attend if you can. And please note, we start at 5pm, not 4pm as previously advertised!